In this paper we propose a novel general method to let a dynamical system fulfil at best a control task when the nominal parameters are not perfectly known. The approach is based on the introduction of the novel concept of closed-loop sensitivity, a quantity that relates parameter variations to deviations of the closed-loop trajectory of the system/controller pair. This new definition takes into account the dependency of the control inputs from the system states and nominal parameters as well as from the controller dynamics. The reference trajectory to be tracked is taken as optimization variable, and the dynamics of both the sensitivity and of its gradient are computed analytically along the system trajectories. We then show how this computation can be effectively exploited for solving trajectory optimization problems aimed at generating a reference trajectory that minimizes a norm of the closed-loop sensitivity. 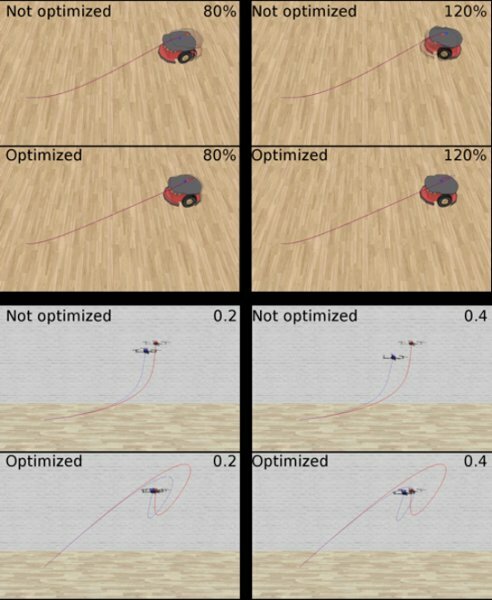 The theoretical results are validated via an extensive campaign of Monte Carlo simulations for two relevant robotic systems: a unicycle and a quadrotor UAV.